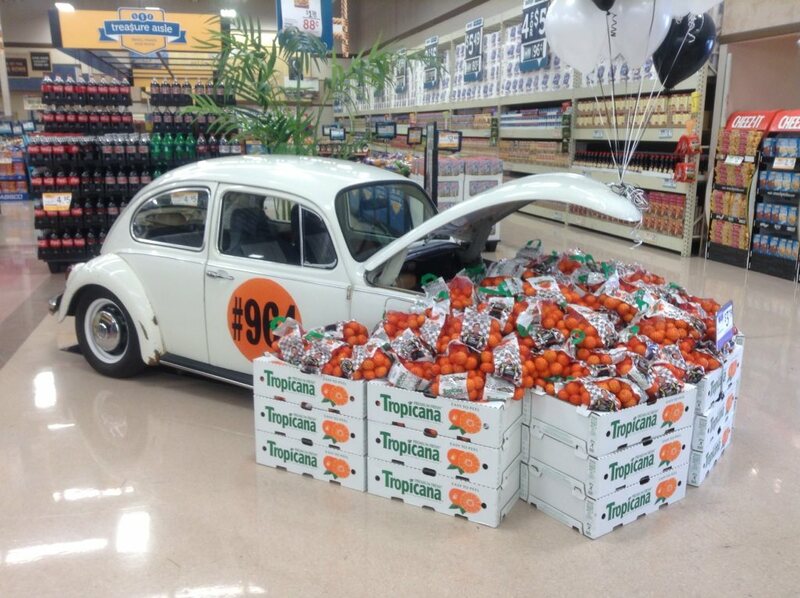 The Bug Boys: Ed the Bug, Jeff Gordon and a Bunch of Oranges? 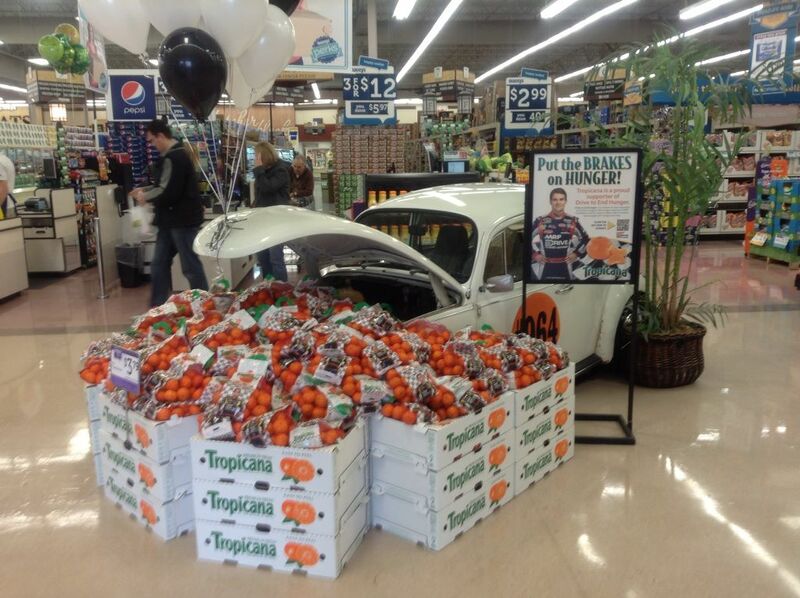 Ed the Bug, Jeff Gordon and a Bunch of Oranges? 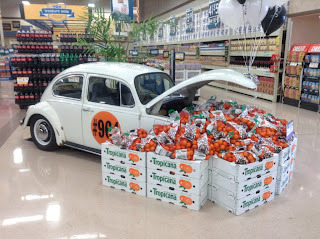 Ed the Bug gets to spend this week in Macey's Grocery Store in Sandy. 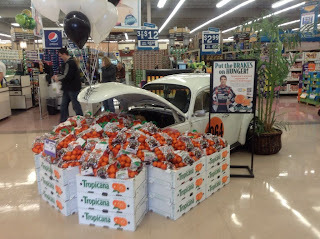 He is on display there to help out with Jeff Gordon's "Put the BRAKES on HUNGER!" which is sponsored by Tropicana. My Brother in law is a manager there and asked if he could borrow Ed for the display. I think it's pretty cool to see him there and the display is really cool. Here are some pictures of the display. You can see it in person at the Sandy Macey's if you want to. I only have these 2 pictures but hopefully I can get time to go up and get some more. It makes me wish I had put the new fenders on him this winter. Hopefully I can get to it this summer. 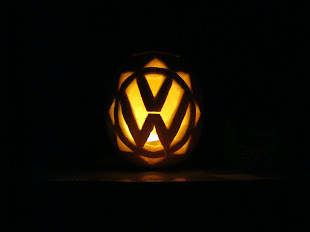 We have a new project in the shop for this weekend. Ellie is loving the old scooter that Isaac had when he was younger. 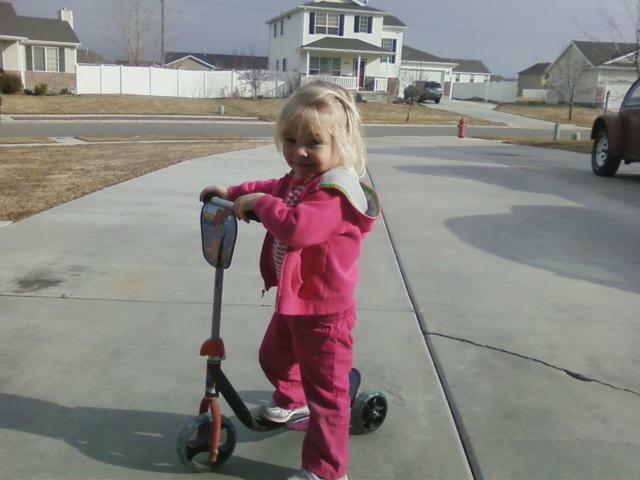 She rides it up and down the driveway and is really good at it. There is only 1 problem. It's a spiderman scooter and she needs something better looking than that. We went to Lowes and bought some pink and purple paint (her favorite colors) that she picked out and so that's on the agenda for Saturday. Hopefully I can keep her off it long enough for the paint to dry. She also has a tricycle that shes just learned how to pedal so we may end up painting that also. We will document all our progress so check it out. The Saturn gets some attention. Sun, wind, oil and exhaust. Saturn needs rings, and then some!